Day 01: Pick up from the airport and drive to Punakha. After arrival drive to Punakha over Dochula pass (3150m). One of the most spectacular pass on your tour with 108 chorten and a Monastery on the hill top. If the sky is clear this provides the best place to see and take photos of Himalayan snow capped mountain ranges which borders Tibet (China),the following are the names of the peaks which can be seen from this pass (left to right): Masagang (7,158m), Tsendagang (6,960m), Terigang (7,060m), Jejegangphugang (7,158 m ), Kangphugang (7,170 m ), Zongphugang (7, 060 m ), a table mountain that dominates the isolated region of Lunana – finally Gangkar puensum, the highest peak in Bhutan at 7,497m.After that we drive down the hill till we feel the warm air of Punakha valley. Day 02: Punakha to Bumthang(2550mtrs). After breakfast we drive to Bumthang. On the way we visit Gangtey one of the few glacial valleys in Bhutan, which lies in the mountains, east of Wangduephodrang. After crossing over the pass, you soon come to the great monastery of Gangtey, established in the 17th century. The village of Phobjikha lies in a few kilometers down from the monastery, on the valley floor. This quite, remote valley is the chosen winter home of rare black necked cranes, which migrate here annually from the Tibetan plateau.Many visitors refer to this place as heaven on Earth. We have lunch in café (Chendebji Café) on the road to Bumthang. After lunch we carry on with our drive. We pass through Trongsa town, and slowly climb up towards the Yotongla pass, the highest pass in your journey. After the pass we descend for Bumthang through the pine forest. Tales of Guru Padmasambhava and the Tertongs(‘religious treasure-discoverers’) still linger in this region. 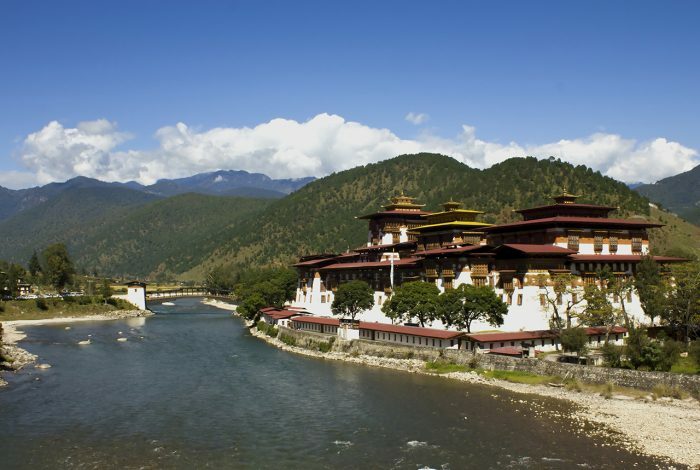 Visit the 7th century Jambay Lhakhang: one of the 108 monasteries built to subdue evil spirit in the Himalayan region. The inner shrine of the Future Buddha is believed to be there some 1400 years ago. Jambay Lhakhang festival is famous for Tercham, it’s also known as the Naked Dance. Indeed some dancers appear naked! Kurjey Lhakhang: Kurjey Lhakhang comprises of three temples. The exciting thing here is comparing the 17th century structure on the right side with the 20th century on the left (built by the Grand Queen Mother). These three temples are surrounded by 108 chorten wall. Kurjey is very special as the kings of Bhutan and other Royal Family members are cremated here. The name Kurjey translates into ‘Kur’ means body and ‘Jey’ means print. Guru Rinpoche has left his body print on a rock inside the main, old Kurjey Lhakhang. The big cypress tree is believed to be the walking stick of Guru Rinpoche. The great Guru also created a holy water hole beside the temple which people frequent either for religious or medical purposes. Tamshing Lhakhang: This Lhakhang (temple) was founded in 1501 by Tertong Pema Lingpa, a reincarnation of Guru Padmasambhava. There are very old religious paintings around the inner walls of the temple, take a torch with you. Bjakar Dzong: Constructed in 1549 as a monastery by the great grandfather of the first Zhabdrung and upgraded in 1646 when the Zhabdrung had firmly established his power. The dzong is now used as the administrative center of Bumthang valley, and also houses the regional monk body. Overnight in the same Guest house. Day 04: Drive to Mongar. Today you drive from Bumthang to Mongar (194km). You will drive through Ura valley. Here the people mostly live out of potato farming, mushrooms business, and dairy farming. They also have an annual festival in the spring. Once you leave Ura valley you are travelling towards the highest point of your tour, Thrumshingla pass. The passes in Bhutan are adorned with beautiful prayer flags. After the highest point, you slowly climb down to warmer valley of Lingmithang. Just before you get to Lingmithang in the valley of Thuethangbi the view of Zhongar Dzong is visible. Covering a total of 8 acres, it once represented the power house of eastern Bhutan. For many years this ruins laid as a forbidden spirit infested area. The locals are very superstitious and atmosphere of fear looms in the vicinity of the ruins. Stories of the presence of certain malevolent spirits and gigantic snakes guarding a treasure of gold and silver are only whispered. Beyond piles of stones and mud, it echoes past life to connect us to the future. Embedded inside is a life frozen in time, a wealth of history that can be still recounted orally by those who also heard it from their grandparents. From Lingmithang you climb up to Mongar. Mongar town is located on a hill. Depending on time we have, we will visit Mongar Dzong, though the Dzong is modern compared to others in the kingdom it is constructed in the same way as the ones from the 17th century Dzongs. The visit to the Dzong shows one, how traditional Bhutanese architecture has continued to thrive through the centuries. Day 05: Day excursion to Lhuntse. Royal family, their exact point of origin is the beautiful village of Dungkhar. Visit the Lhuntse dzong which was built in the year 1654 by the Trongsa penlop (Governor)Minjur Tenpa. To see the Lhuntse district properly you need to explore it on foot and need good amount of time. Also visit the Guru statue being built by Lama Karpo for the peace and prosperity of the world in general. Later drive back to Mongar. Day 06: Drive back to Bumthang. Drive back to Bumthang (219km). Before reaching Bumthang visit the Tang Membar Tsho (burning lake). Day 07: Drive to Punakha. After breakfast drive back to Punakha. On the way back we visit the Trongsa Dzong, built in the year 1648. This Dzong holds a great historical importance. It is customary for all the kings of Bhutan to be invested as Trongsa Penlop (governor) prior to ascending the throne. You will be thrilled by the massiveness of the Dzong that literally covers a hill top. After the dzong in Trongsa we continue our drive to Punakha with a stop for lunch at Chendebji café. Overnight in Punakha. Day 08: Drive to Thimphu (sightseeing) and later drive to Paro. After breakfast drive to Thimphu. In Thimphu we will take you through the National Memorial Chorten, here meet the elderly generation in circumambulation of the Chorten. Chorten literally means “Seat of Faith” or the “Mind of Buddha”. Treat yourself with fantastic depiction of Buddhist teachings in form of paintings and sculptures in this temple. As the name denotes this National Memorial Chorten was consecrated on July 28th, 1947 in the memory of the Third King. Institute for Zorig Chusum, commonly known as the Painting School, the institute offers you a glimpse of novices learning 13 traditional arts and crafts of Bhutan. Enjoy few moments with the future artists of the country. The Folk Heritage Museum, also known as Phelchey Toenkhyim is dedicated to connecting people of the Bhutanese rural past through exhibits. The house dates back to 19th century. You can also see a traditional watermill. The national animal “Takin”. You can see the national animal at the Takin preservation. It is a very fascinating animal with a very fascinating story about the creation of the animal. Depending on time availability we visit the Post office and Handicraft emporium later in the evening drive to Paro. Today we are going for a hike to the magnificent Taktsang Monastery. Often called the Tiger’s Nest, perched on the cliffs, has awestruck many a visitor. “Trip to Bhutan is never complete without climbing to Taktsang”, says one visitor. Indeed it’s true as the journey there fills you up in spiritual bliss. For those not choosing the spiritual side, it is the dramatic landscape and the artistically built monument that becomes a hiker’s delight. Let us take you to this dramatically set Buddhist relic hanging from a cliff. Experience the uphill climb as you ascend more than two thousand feet from the valley floor. It is said that Guru Rinpoche arrived here on the back of a tigress and meditated in a cave which is now inside the monastery. This site was recognized as most sacred and visited by Zhabdrung in 1646 wished to build a monastery and now almost every Bhutanese visited this monastery. It was built in 1692 and was mysteriously burnt down on 19th April 1998. The fire damaged the main structure of the building and some religious contents. The monastery has been renovated and restored to its former glory. It takes about 2-3hours to get to the monastery from the motor road end. Enjoy vegetarian lunch at the cafeteria while climbing back. On the way back visit Kichu Lhakhang which was built on the same day as Jambay Lhakhang in Bumthang. It is said that 108 monasteries were built on the same day. Later in 1968, the Royal Grandmother, built a second temple alongside the first one, in the same style. Inside the courtyard, there is an orange tree that bears fruits throughout the year, which is quite amazing because nowhere in the valley you can find orange trees bearing fruits with the exception of one more temple. Rinpung Dzong: Built in 1646 by Shabdrung Ngawang Namgyal, the “fortress of the heap of jewels “stands on a hill above Paro Township. The approach to the Dzong is through a traditional covered bridge (called the Nemi Zam) and then up a paved stone path running alongside the imposing outer walls. The valley’s annual springtime religious festival, the Paro Tsechu, takes place in the courtyard of the Dzong and on the dance ground on the hillside above. Overnight in Hotel Jigmiling.